The National Green Infrastructure Certification Program (NGICP) on June 30 awarded certifications to 46 additional individuals. This latest class of certificants brings the total number of credentialed green infrastructure workers recognized by the program to 108. NGICP is the first U.S.-wide initiative to build and recognize a workforce skilled in sustainable construction. The Water Environment Federation (WEF; Alexandria, Va.) last year partnered with DC Water (Washington, D.C.) and several water utilities across the U.S. to establish the program, which seeks to provide qualified talent for the growing number of in-demand jobs. Participants receive training on a green infrastructure construction, maintenance, and inspection curriculum conceived to meet international best practice standards. Then they sit for the certification exam. Certifications remain valid for 2 years. The inaugural NGICP exam was held in December 2016, with a second exam in June 2017. The next class of NGICP trainees will undergo training this fall, and a third testing session will take place in November. Currently, access to the NGICP is available only to select communities in Maryland, Pennsylvania, Virginia, Wisconsin, and Washington, D.C. By early 2018, program administrators expect to roll out the program across the U.S., providing certificate-holders proof of their skills across state lines. 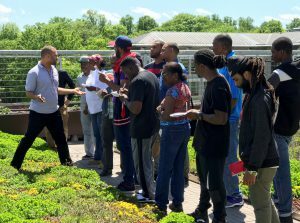 Hopeful green infrastructure technicians get an up-close look at a green roof atop the University of the District of Columbia, one of many low-impact stormwater management tools they will learn to build, maintain, and inspect through the National Green Infrastructure Certification Program. DC Water. Housed under the WEF Stormwater Institute, a knowledge-sharing group comprised of the country’s leading stormwater management experts, the NGICP supports community-based job creation in U.S. cities and will serve as the first green infrastructure-focused workforce development program with a national scope.